Why can't we buy smart mirrors yet? When Google software engineer Max Braun found out there are still no official smart mirrors on the market, he decided to build his own in his spare time. And even as this isn't the first time we've seen a DIY smart mirror before, the result of Braun's project turned out to be a sleek, Android-powered mirror that you never knew you wanted in your bathroom, until now. He detailed the in a blog post on Medium, explaining that he used a two-way mirror, a display panel, a controller board and a "bunch of components and arts and craft supplies." 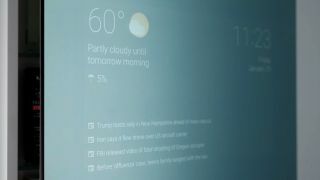 With the a bit of experimenting, he says, he was able to create a smart mirror that sits on the door to the medicine cabinet showing him the weather, time, date, news and reminders, using Android APIs. "Other concepts I'm playing with are traffic, reminders and essentially anything that has a Google Now card," Braun explained, adding that the idea behind the UI is that you don't need to interact with it. Instead, it should update automatically, with an open-ended voice search interface for everything else. The whole thing sits a few millimeters thin, with the small electronics hanging out inside the door of the medicine cabinet. It's a little messy, Braun explained, seeing as it's just a side project currently, and that he's been experimenting using a Chromecast, Nexus Player and Fire TV Stick to power the thing. Still, it's an impressive and good-looking piece of home tech that leaves us wondering why we can't buy one yet.